Don't worry. Be happy. Keep learning. : Create Blanket Storage with a Ladder. 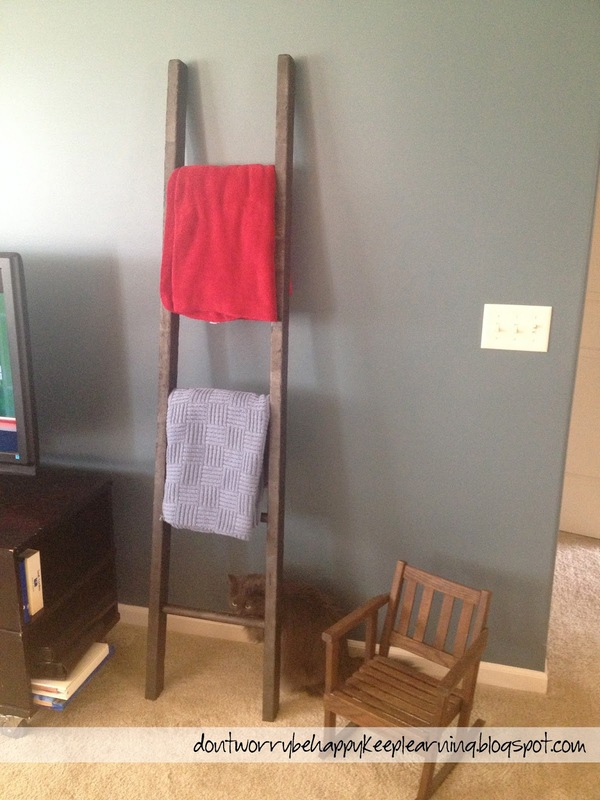 Create Blanket Storage with a Ladder. Recently, I shared with you the shelving project I completed in our garage. I mentioned that the wood came from my dad's barn. I also showed you this picture that included a ladder that we'd cut in half. The time has come to share with you my Ladder made into blanket storage! It was very simple. 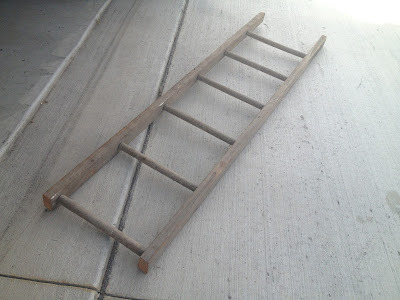 My dad had a 12' ladder sitting in the barn not being used, so I had him cut it in half to make 2 - 6' ladders. 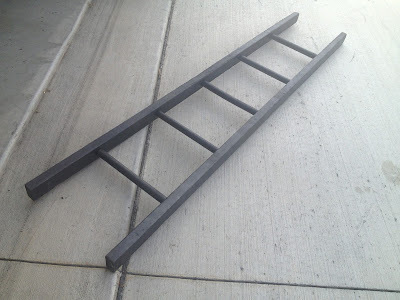 I brought them home and spray painted the ladder with a dark, almost black spray paint. And done! Finding the right spot for it in the living room took a few minutes but I'm super happy with it. It's a piece of furniture I've been wanting to get done for quite a while. And knowing that it's from my dad's farm makes it that much better. My cat always seems to find a way into my project photos. Most times I don't use those, but I figured this one was cute to share. She's just sniffing it out and making sure it's safe to have in the house. Cat approved! Tips: In hindsight, I probably should have sanded the ladder. (DOH!) Every time I shifted the ladder in our living room to decide where I liked it placed I nearly splintered my hands. If I'm feeling energetic this fall or winter, I might take the ladder back into the garage and redo it so it's safer. at 12:33 PM Topics: Blog., Crafts., Design., DIY., Organization. Love it as well! I use one in my half bath to hold towels. I left it grungy to go with my barn theme! I like how you cleaned yours up. It's ironic that you mention the cat approving something coming into your home...... We have to be careful bringing barn items into our home because another barn cat could have marked his terrority in the past! I ran into this issue with an milk old crate I bought at an antique store... Bleck! I remember seeing yours in your bathroom when I was there a while ago and I thought "Why have I not done this yet?" HA! I would not have thought about the barn cat marking thing! yikes! I only soap/hosed mine off and painted it. Maybe that masks whatever might have been on it.